Thanks to our British colonial heritage, when food is associated with tea, many South Africans imagine cucumber sandwiches, cakes, scones, crumpets, cream, jams and tarts to be taken in the afternoon, in the tradition of the high tea invention of Anna Russell, Duchess of Bedford (d. 1857). Tea made by infusing hot water with a fruit, flower, or leaf is found all over the world. Among the most well-known are: in South America, maté (from a type of subtropical holly); in Canada, Labrador tea (from Arctic rhododendrons); in Australasia, manuka (from a native tree first used for tea by Captain Cook); and in South Africa of course buchu and rooibos. But true tea only comes from a single plant species, Camellia sinensis, and it is one of the many great gifts China has given civilization. Last December, Lisa Tsai, wife of tea merchant Mingwei Tsai, opened O’ways Teacafé, where one can luxuriate in choosing teas from a selection of over 60 varieties and appropriately enjoy Chinese and fusion cuisine. It is also to the best of my knowledge the only exclusively vegetarian restaurant in Cape Town. There are no chocolate cakes rotating in the window here and the food is many notches above what one expects from a café. For starters, the chef, Marion Kumpf, was for years sous chef at elite Aubergine. The interior is welcoming, neat, open and clean, yet the decor has that honest, quirky charm and appeal that an individual proprietor (as opposed to an interior decorator) often brings to a premises. The designer chairs are transparent with honeycomb backs; the mismatched tables high-sheen white; the bar built from facebrick; teapots dangle from the ceiling; an oriental rug is a wall-hanging; hessian bags with exotic labels cover a concrete ceiling beam. Mrs Tsai spontaneously plays a repertoire of popular classics on the baby grand piano. For those who at this point might be growing nervous I should add that she plays well and there is also a good selection of artisanal roast coffees: Ethiopian Harrar, Kenyan Gethumbwini Estate AA; Brazilian Cachoeira; Bolivian Colonia San Juan 8 and more. Instead of cured pig and eggs consider the following for a delicious breakfast: warm almond waffle with spicy mango and coriander salsa; roasted rolled oats and wholewheat bran flakes in banana milk; their very popular Taiwanese Dan Bing pancake omelette with guacamole and lime yoghurt; buckwheat “snippets” with chocolate milk jam and strawberries or an open Brioche sandwich with melted mozzarella, pesto and mushroom paté. For sweets: a slab of white chocolate with Ethiopian coffee beans and dried stone fruits; a fruit quiche with vegan ice cream; warm almond croissant with cling peach and cardamom sauce or tofu fridge cheese cake. On the second occasion I lunch here, Mingwei Tsai is preparing nine flower teas for their public tea club (held every month on the first Saturday at 3:30pm). But this time I’m after the dim sum experience. Manager Nehemia Simons suggests as companion jasmine Bai Hao, a semi-fermented oolong tea scented with jasmine blossoms, and apparently formerly reserved for the use of the Imperial Court. The tea develops an alluring golden colour as it brews on the table in the glass teapot warmed by a tealight candle. Kumpf, who knows I’m there, sends out a basket of delicious freshly baked breads with a carrot dip, and, as an amuse-gueule, roast tofu with shredded beetroot and paper thin slices of cucumber. I start with a petite bowl of green asparagus, light, fluffy risotto and rocket leaves. 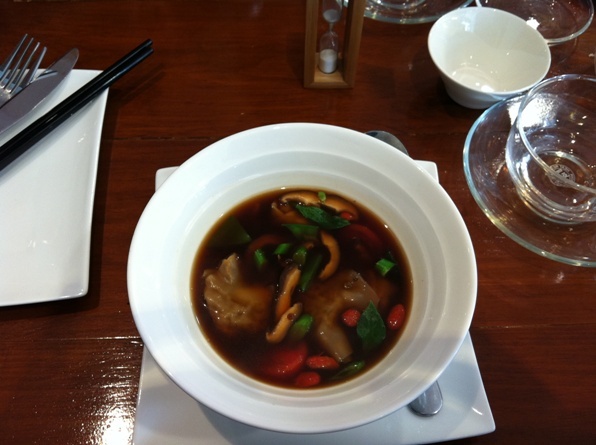 A generous bowl of wonton soup presents itself with a rich soy aroma, almost caramelized on the nose. It’s a punchy broth with cloves, cardamom, cinnamon, chili and whole peppercorns, halved cherry tomatoes, shitake mushrooms and goji berries. The potstickers are filled with crushed mushrooms. 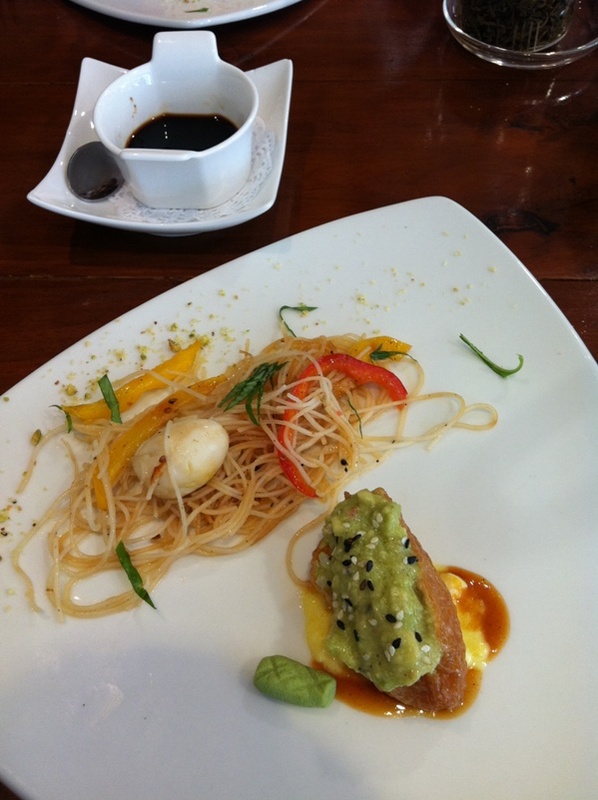 Next is a vermicelli salad with a quail egg and a rice stuffed bean curd pocket with wasabi on the side. The plate is elegantly sprinkled with finely crushed pistachio nuts and desiccated coconut. 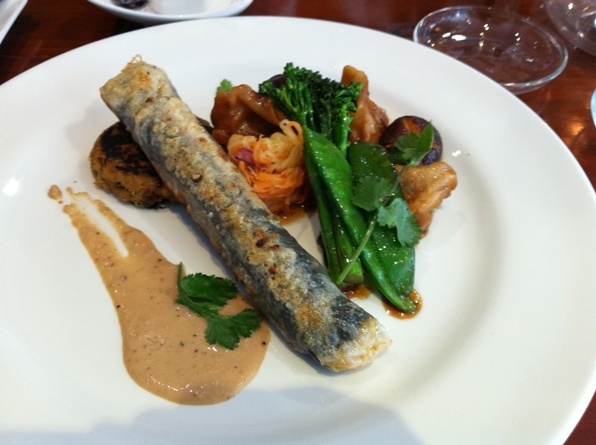 Finally, a substantial platter of delights arrives that at first seems insurmountable, but is soon conquered with relish: a pancake-sized spring roll with peanut puree; a vegetable fritter; several delicious har gau (dumplings); tender stem broccoli, snow peas, mushrooms and a carrot salad. Interestingly, these yummy dishes seem to be accomplished without resorting to onion or garlic. Kumpf says a substantial number of customers are regulars, some coming daily. Testament to this is the wall of loyalty cards with their patrons’ names on them. She feels she needs to change her affordably priced menu every six to eight weeks to keep her clientele interested, and she adds it keeps her on her toes too and standards high. I know for sure this is one restaurant I will return to often. O’ways Teacafé, Shop 2, Heritage House, 20 Dreyer Street, Claremont 7708. Tel: 021 671 2850. Open Mon-Fri: 7:30am – 5pm; Sat: 9am – 2pm. An edited version of this article first appeared in the Mail & Guardian, September 2011.